Adele has been named as Britain's richest ever female musician, according to the Sunday Times Rich List. A list of the top 50 music millionaires in the UK and Ireland puts the singer's £85m fortune in 30th place. Her boost in wealth was aided by the release of '25' in November her first album in four years which had exceeded 15 million global sales by January of this year. The only female singer with a bigger fortune on the list - which also covers Ireland - is Irishwoman Enya on £91m. 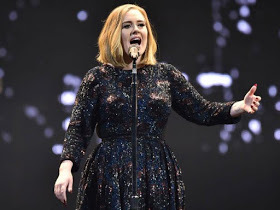 For the fifth year running 27-year-old Adele is also ranked top of the Young Music Rich List, covering those aged 30 and under. Adele is now ranked at number 30 in the overall UK and Ireland music millionaires list. She's one of just three solo women to make it onto the 2016 list.